GTPase target characterization of Ras and Rho GEFs using a GEF-mediated exchange assay with BODIPY-FL-GDP to measure changes in fluorescence emission intensity as fluorescent GDP was competed off by unlabeled 500 µM GTP. 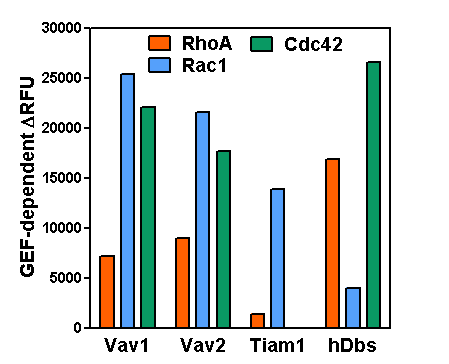 Rho GEFs Vav1, Vav2, Tiam1, and hDbs were tested against RhoA, Rac1, and Cdc42. GEFs were used at a concentration of 1 µM and GTPases at a concentration of 2 µM. Rosenberg et al. recently investigated the molecular mechanism responsible for cortactin’s regulation of actin polymerization underlying the maturation and function of invadopodia in breast cancer cells. Release of epidermal growth factor (EGF) stimulates formation of invadopodia, actin-enriched cell protrusions essential for extracellular matrix degradation and cancer cell invasion. The EGF receptor-Src-Arg kinase signaling cascade results in phosphorylation of cortactin. The authors found that two tyrosine-phosphorylated residues on cortactin (Y421 and Y466) bind the SH2 domain of Vav2, a guanine nucleotide exchange factor (GEF) for Rho-family GTPases such as Rac. Tyrosine-phosphorylated cortactin recruits Vav2 to invadopodia, which facilitates their maturation and subsequent invadopodia-mediated matrix degradation and cancer cell invasion. Invadopodial function depends upon re-arrangement of the actin cytoskeleton, all of which requires phospho-cortactin-mediated recruitment of Vav2 to the invadopodia. Furthermore, Vav2’s regulation of actin cytoskeletal dynamics involves Rac3 activation, though the exact role of GTP-bound Rac3 remains unclear. Cytoskeleton’s RhoGEF Exchange Assay Kit and biotinylated actin (Cat. # BK100 and AB07, respectively) were essential reagents in this study, providing the tools necessary to identify Vav2’s substrate targets and effects on actin cytoskeletal dynamics to aid in the development of anti-cancer therapeutics that act by interfering with invadopodia function. Rosenberg B.J. et al. 2017. Phosphorylated cortactin recruits Vav2 guanine nucleotide exchange factor to activate Rac3 and promote invadopodial function in invasive breast cancer cells. Mol. Biol. Cell. 28, 1347-1360.